So I knew CYC had a web cam so I could view what the wind looked like on the lake to go paddling there. However When I googled for Canberra Yacht Club I only got the Southern Cross club pages (the group that owns the CYC) concerning the club. The link to the actual operational website did not turn up. Thus this is to remind me where to find the Canberra Yacht Club website and the Lake Burley Griffin webcams linked from the front page there. I guess the URL should have been obvious to me without a google search. My sister and I went to see the new Bond movie today, Quantum of Solace. Although the title is somewhat lame, the movie itself was in my opinion an excellent Bond movie. There was not too much of a focus on action, it was not over the top and the entire move developed the character really well I think. The dynamics between the major players and what happened through the movie was interesting and entertaining, there was no incredibly annoying and IMO stupid card game like in the previous movie. Also the bond girl thing did not happen as it normally does which I think improved the movie. 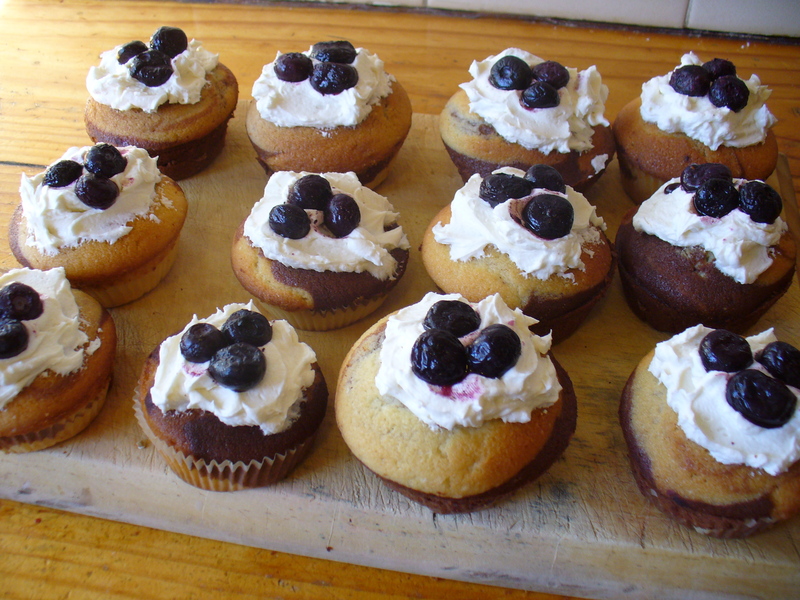 Marbled Cupcakes (fullsize) So someone on p.l.o.a (who is also vegan) suggested it is the time of year for baking. Who am I to argue, this photo is of a batch of Marbled cupcakes with buttercream icing and blueberries on top from the Vegan cupcakes book I got the other day. As vegetable shortening is not readily available in Australia (unless I buy some Crisco from David Jones, imported by USAFoods in Melbourne) I decided to simply use Nuttilex in the icing. The other option is mixing in some Copha (which is a coconut oil product, solid at room temperature) however it seems the icing has turned out alright, maybe a bit runny but it worked. 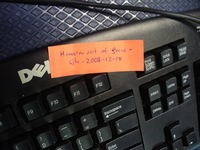 Broken Hardware Label (fullsize) I noticed a hard drive on a bench here with the label affixed to it written by one of us "Broken Harddisk - username - May 2005". Thinking about it I considered the fact that there was excessive information on the label, to anyone here it is fairly obvious that this is a hard drive. 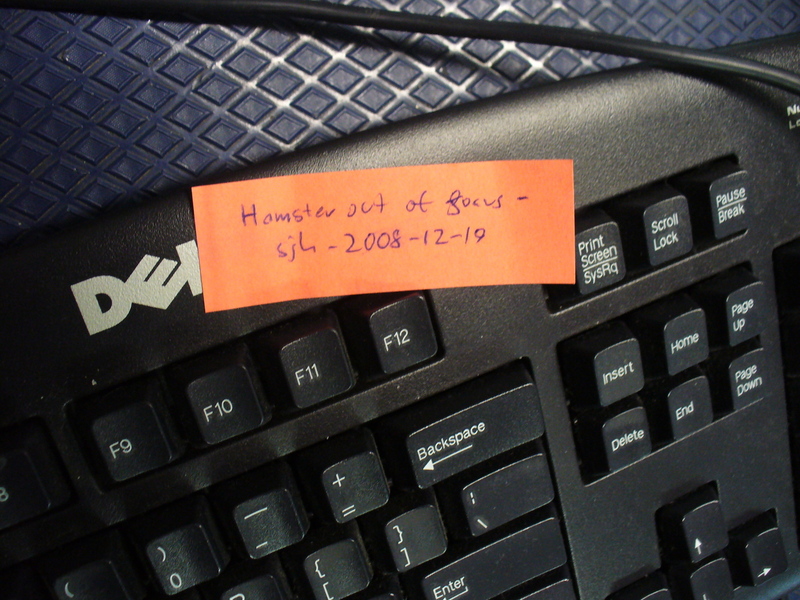 We always ensure broken hardware has a label like this attached with the name of who noted it was broken and the date on which we noted this. However thinking about this excessive information I began wondering if we could instead try messing with people's heads. Instead of saying broken hard disk we could instead say Broken rabbit. This of course led me to take the photo to the left, after all is that not what you consider and accurate and useful statement about the hamster in the photo? When my Garmin Forerunner 305 finally really died with the crack and subsequent internal soaking I thought I had to send it away to the US and pay the repair fee in US dollars as well as getting it over there and back. I am happy to report that Garmin is a much easier company to deal with for us Australians than that. I finally decided I wanted my HRM/GPS enough to arrange the shipping to the US and contacted Garmin. I was pleased to discover they allow you to send it into the Australian Garmin support people and they will repair or replace the unit for the flat fee they use of around AUD $109. I sent mine in last week and today in the mail a brand new Forerunner 305 arrived. It will be good to be geeking out with my wrist hardware again during my run tonight and ride tomorrow morning. Thanks Garmin for making this an easy and painless process. After reading Little Brother recently I was keen to buy a copy. I also wanted to get hold of the Last Watch book by Sergei Lukyanenko, and I had been keen on getting Neil Gaiman's The Graveyard Book. However of those three only The Graveyard Book was available in Australia already. The Watch book did not get released in the US when it was supposed to, however I discovered it had been released in the UK. The other books were also available there. So i made an order with Amazon UK to get those three books, and while buying from there anyway I also got a copy of Vegan Cupcakes Take Over the World. I was happy today to receive all of these books in the mail at work, yay some good reading, some fantastic food and hopefully some more things to keep my mind occupied at the moment. Once again showing it would be so much nicer if things were released internationally at the same time so I could have bought them locally. Every time in the last few days I have had time to think or look around it has hurt or I have been upset. Fortunately my friends have helped me out, trying to keep my mind occupied and busy. However today I ended up with a large stretch of time and ended up finally watching the new Doug Anthony All Stars dvd. I was somewhat ecstatic a few weeks ago when I saw in an ABC shop catalogue that a new Doug Anthony All Stars dvd was available. I have mentioned here from time to time that I am a long term fan of their stuff. I still have the London video and a cd from Edinburgh, however when I moved back from Sydney in 2001 I somehow misplaced my copy of the so called New York video (Live at the National Theatre) and the Edinburgh Years movie. So I have been somewhat bereft of Dougs material to watch. The new dvd that has been released is a collection of lots of their Big Gig material which is great to see. I remember watching the show when it was first on tv, however I do not remember the content, so to see more DAAS from then is great, I can also see a lot of their material and notice how it changed in the time between those shows and Dead & Alive or DAAS Kapital. It would be great if more of DAAS Kapital (weird though it often was) were also available now days. I enjoyed watching the first of the two dvds tonight and am happy to say reliving my memories of all those songs and the attitude they would take trying to get a rise out of any situation and to mock and piss take any religion, famous situation or personage if they thought it could be in bad taste or just downright funny was good to keep my mind occupied for a while. Lots of fun, thanks Tim, Rich and Paul. So after around 7 wonderful months in a loving relationship it appears that as of tonight we are no longer together. I am upset and trying not to cry at everything I see around me. The hardest problem is we both admit to each other we love and adore each other, however due to some concerns about something that happened to us when we met my now ex partner says she feels we can not be together long term. I think it is time to go and cry myself to sleep. A rather uninteresting title, however it pretty well sums up the experience. I had a quick look at some of my maps last week and decided for Friday and Saturday we would head out for an overnight bushwalk from Corin down to Orroral Valley, camp there and then walk up to Honeysuckle Creek and on around the back of Mt Tennant to the Namadgi Visitors centre on the Australian Alps walking track. On Friday starting fairly late (11am ish in the end) we walked along the Square Rock track, turned off toward Smokers Trail and walked down that all the way to the Orroral Valley walk. We finally stopped and camped in the valley around 4pm and that was really rather lovely. Doing the late start thing again we did not get going until 11am on Saturday, which was probably a little bit too late as looking at what was in front of us there was a lot of distance, some big hills and some interesting looking tracks. Got to Honeysuckle for lunch around 1:30pm and enjoyed a short rest while eating. Then headed on to the rather spectacular Alpine Walking track, this is a spectacular walk, really lovely bush surrounding you, a variety of scenery and terrain and it finishes off going down the Mt Tennant walking track to the visitors centre. The walk was really good, however i stupidly did not take the normal precautions I would with my feet for a long rogaine or for an adventure race, so I ended up with blisters on my little toes and just under my big toes. Silly really as if I had simply used socks I know are good for a long rogaine, slathered my feet with Guerneys Goo and put sports tape on at the first sign of any problem I would have been fine. Fortunately my feet are already feeling a lot better today. Fun was indeed had.